Very common annual weed, especially of disturbed ground such as flower beds and vegetable patches. Often has a prostrate and spreading habit. Oval, fresh green leaves in opposite pairs, the upper ones unstalked. Small starry white flowers are produced at almost any time of the year..
Grows almost anywhere, but especially on fertile, well drained ground. Considered as a ubiquitous garden weed, although it is fairly easy to control. Often used as animal fodder and sometimes for human consumption as a wild salad food, it is rich in vitamin C and B. 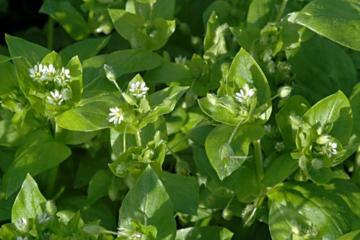 Also used as a medicinal herb, as an anti-inflammatory and to treat a variety of ailments, including rheumatism and obesity. Common European native, now naturalised worldwide.